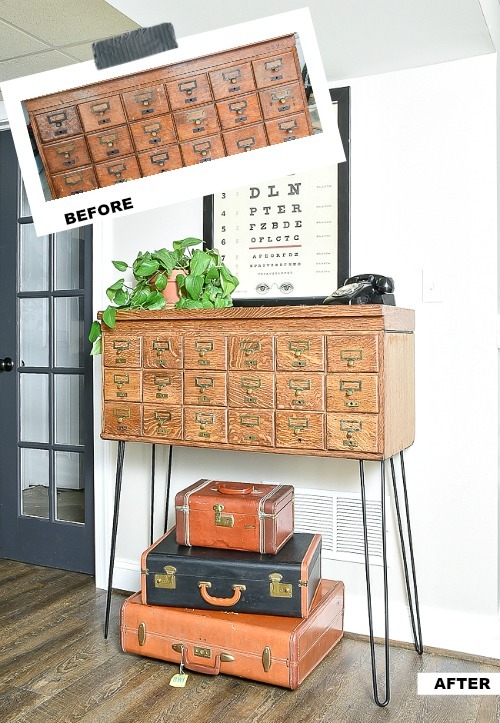 An 18 drawer vintage card catalog gets refinished with new stain and hairpin legs for a fresh modern makeover. 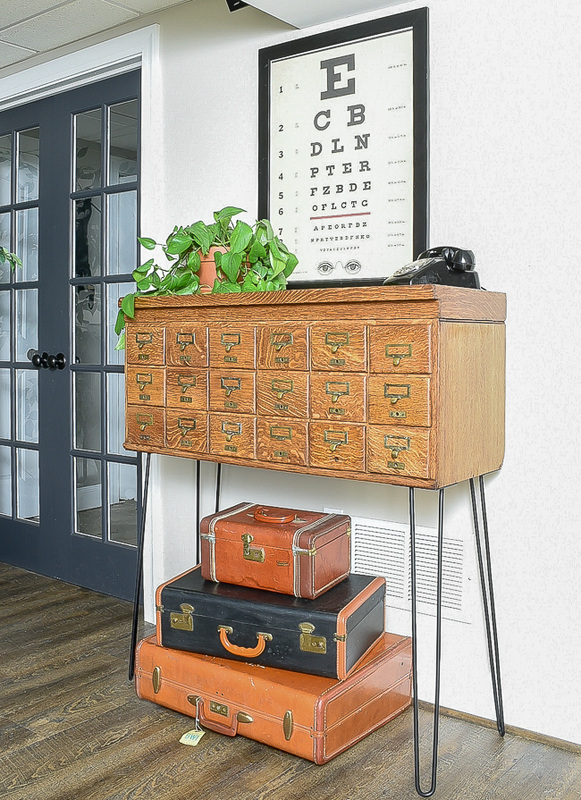 I've been able to find and transform some amazing pieces throughout the years, but scoring an authentic 18 drawer vintage card catalog is definitely at the top of the list. 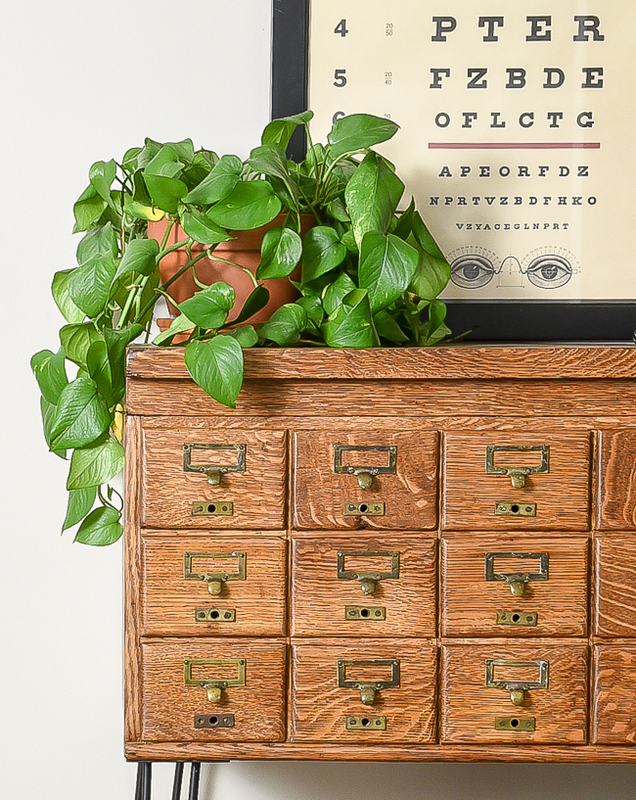 Ever since I can remember, I've been searching for a card catalog that wasn't crazy expensive or too far away. It wasn't until a recent late night search on Facebook Marketplace that I FINALLY lucked out. 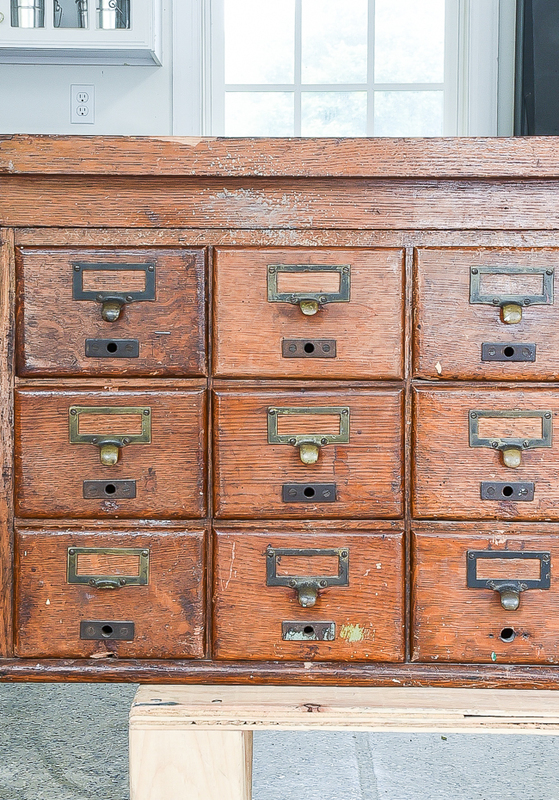 You guys, I actually found a card catalog that was less than $100 and only 30 minutes away! I messaged the guy right away then woke up bright and early the next morning to snag it before anyone else could. 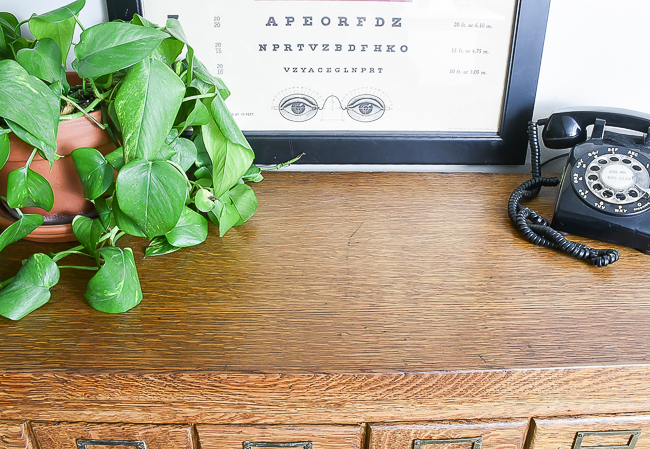 Can you believe this beauty was saved from a dumpster? The guy I bought it from just happened to pass a house that was cleaning out and hauling stuff to a dumpster. 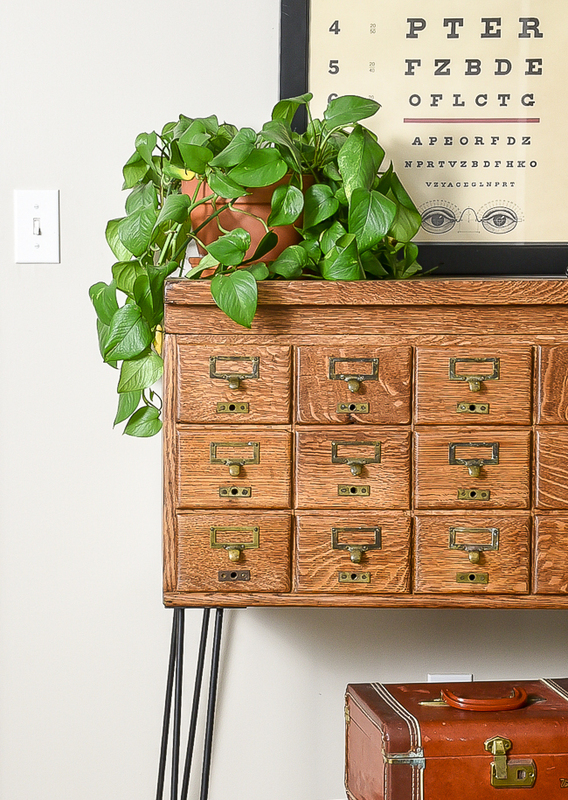 He saved this gorgeous card catalog as well as a few other amazing pieces. It wasn't in the best of shape when I bought it, but it was beautiful and had so much potential. 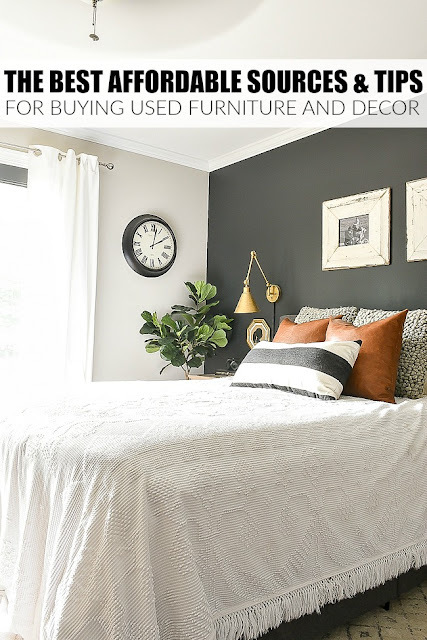 As much as I dreaded refinishing another piece of furniture (remember just a few months ago when I said I would never refinish another piece of furniture any time soon?) I knew the card catalog would be worth the hard work. 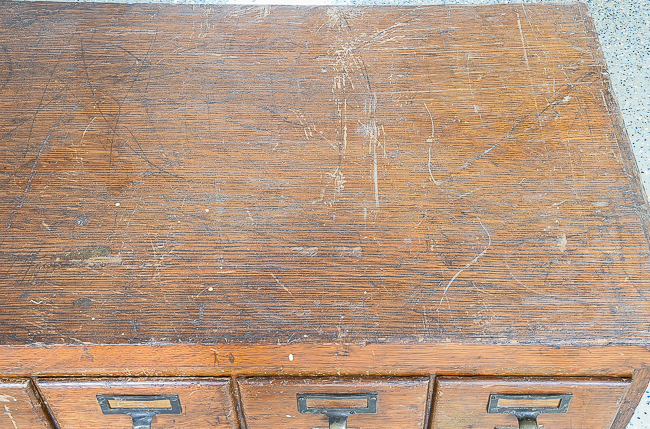 The drawers had some minor scratches, gashes, paint splatters and wear, but the top was where most of the damage was. 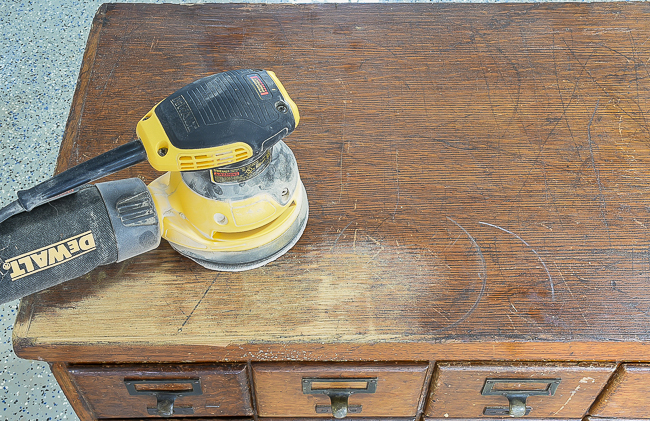 I started by sanding the top of the card catalog with my Dewalt orbital sander and 100 grit sandpaper. 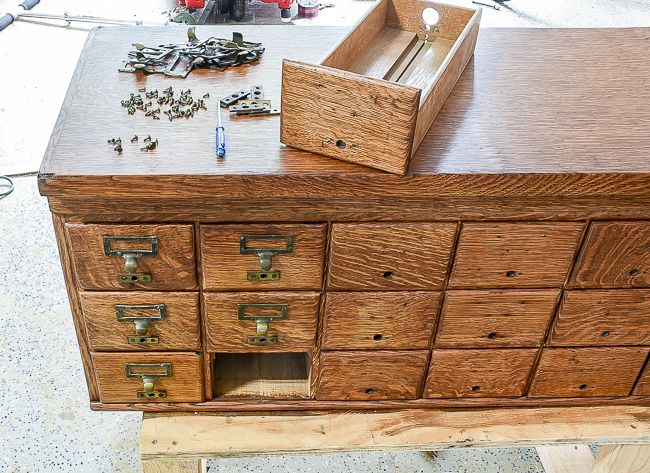 Once the top was completely sanded I worked on removing the hardware and 937 tiny screws. Okay, I may be exaggerating just a bit, but nonetheless, there were a ton of screws. 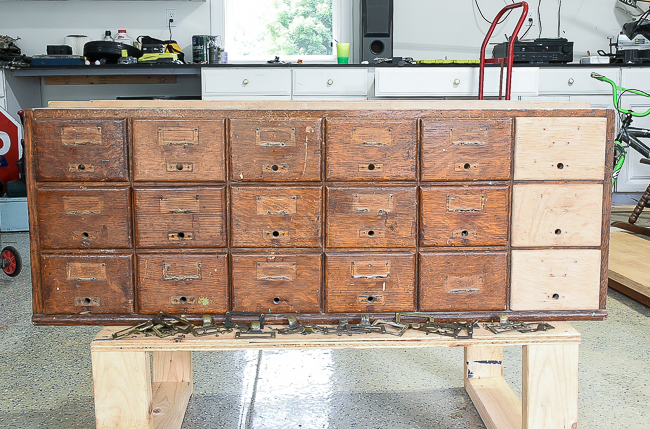 I then removed and sanded each drawer and sides of the card catalog. 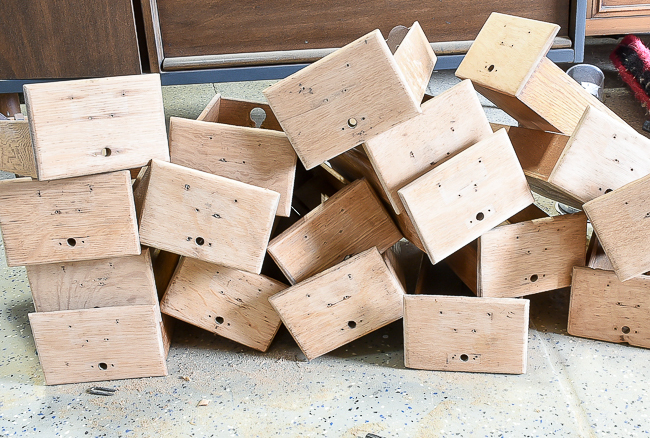 I tend to get bored easily when working on projects, so I sanded a few drawers at a time until all 18 drawers were done. 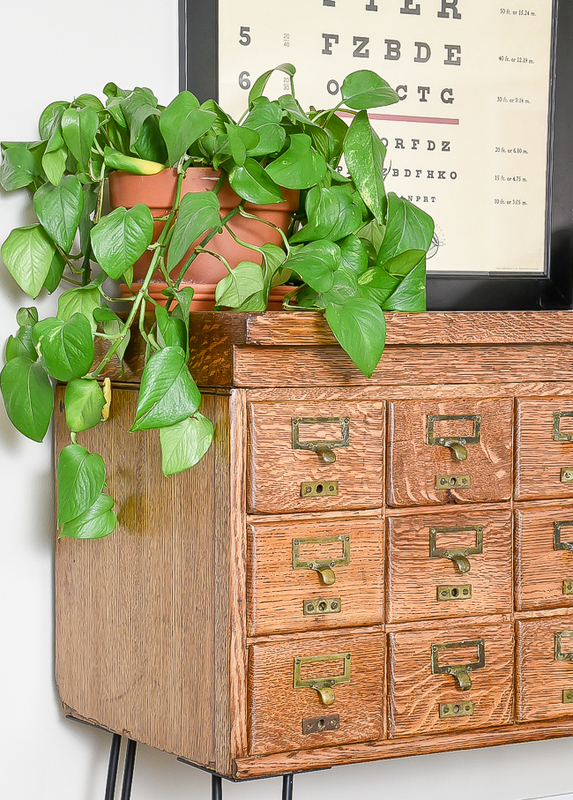 I wanted to keep the card catalog as authentic as possible and really tried to match the original stain color as close as I could. I chose Minwax Special Walnut and think it turned out beautifully. 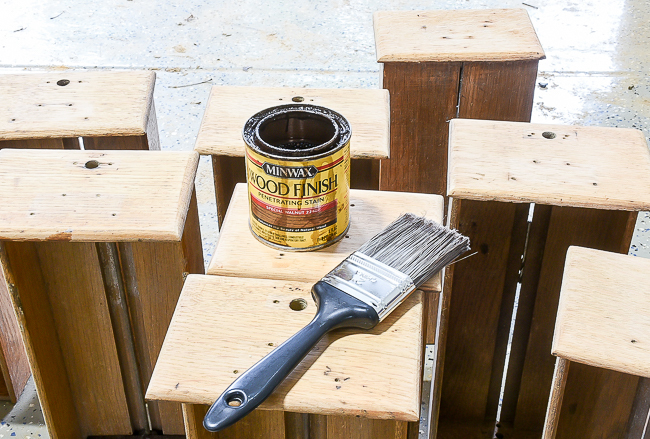 I ended up doing two coats of stain and two coats of poly. While the last coat of poly was drying, I took the hardware inside to give it a bit of a cleaning. 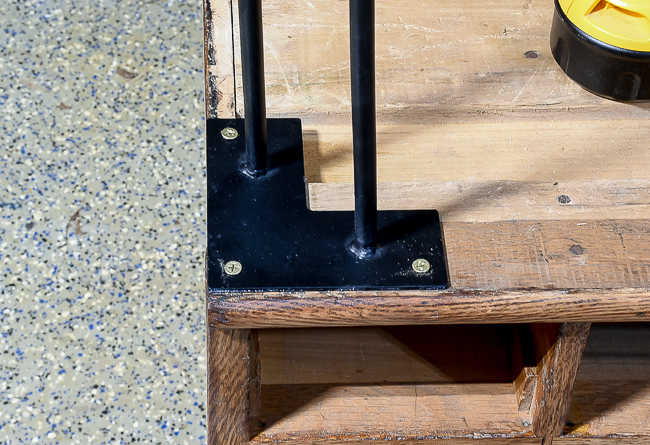 I liked the patina and aged look of the original hardware, so I just cleaned it lightly with Brasso. I went back and forth whether or not to build a base and add wood legs to the card catalog or use hairpin legs. 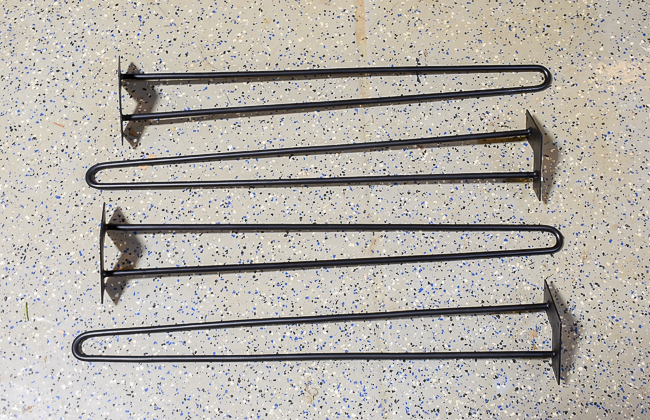 Ultimately, I felt hairpin legs would look best and went with 28" steel 2-rod hairpin legs from Crates and Pallet. 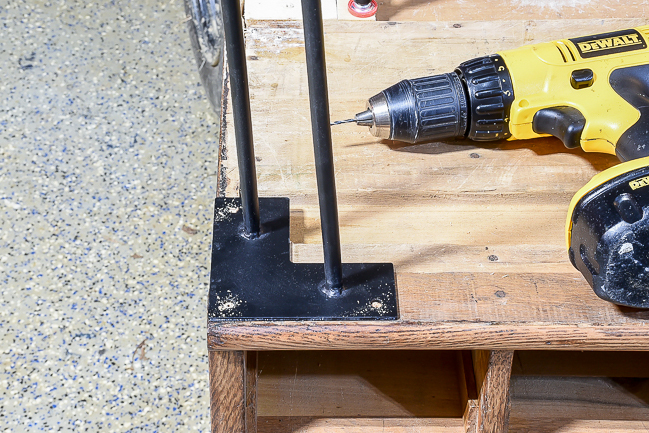 To prevent the wood from splitting, I predrilled holes then attached each leg with 3 one inch screws. 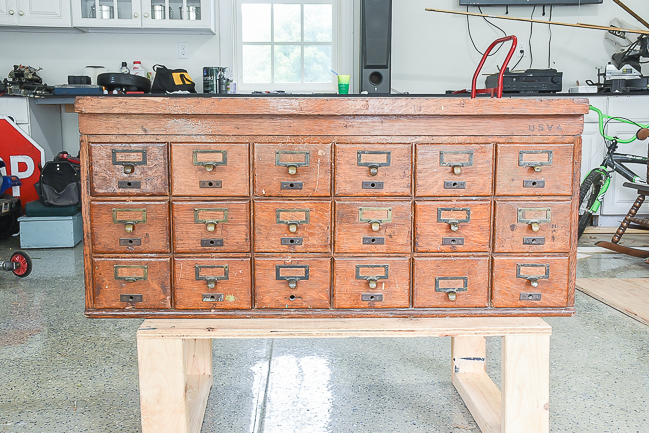 The bottom of the card catalog isn't perfect and there are still some minor imperfections in the top, but I couldn't be happier with how it turned out. Just look at those legs! I moved it into the basement and it fits perfectly on the small wall leading into my husband's office. I had a vintage hardware cabinet in this same spot previously, but it wasn't ideal since it completely blocked the vent. 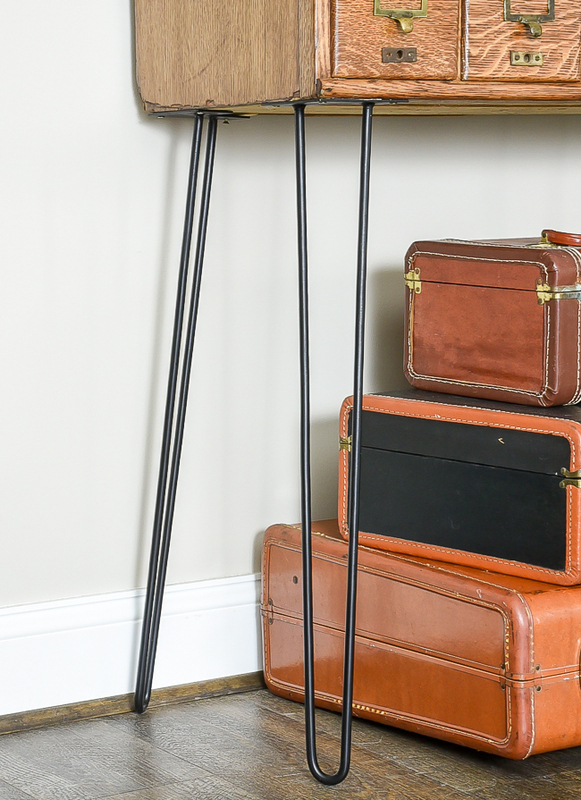 My favorite part about this little area is that it's completely decorated with inexpensive and thrifted finds. 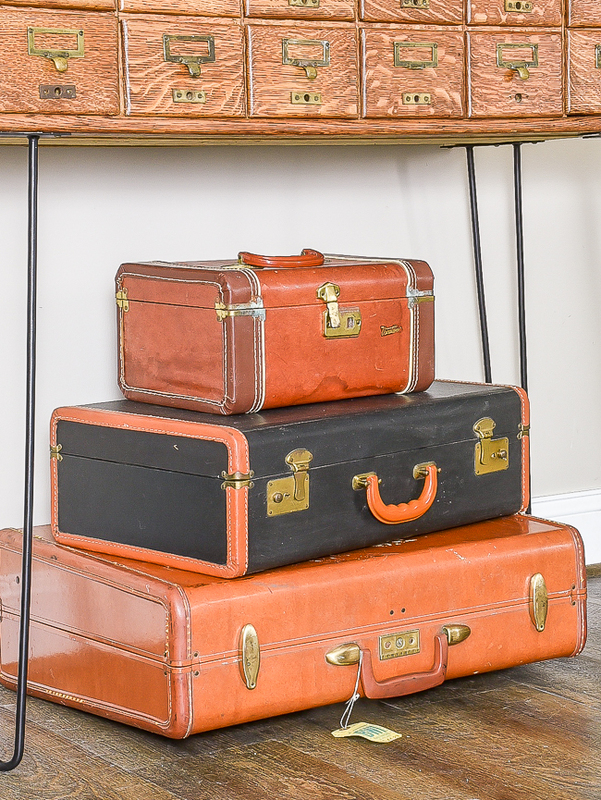 The plant was left behind from the Better Homes and Gardens shoot, the suitcases were all auction and thrift store finds (the large one on the bottom was a $5 auction score and I love that the tag is from our local airport and dates back to 1944! 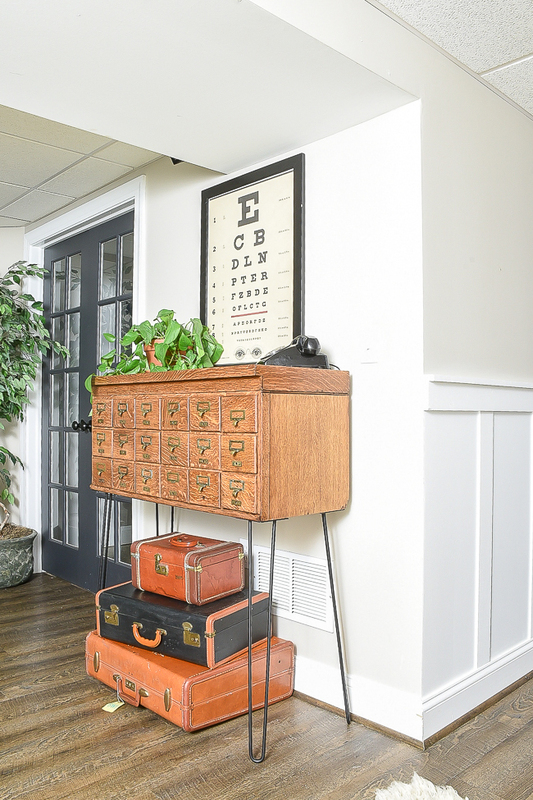 ), the rotary phone was from a church mission store and the eye chart was less than $6.00. 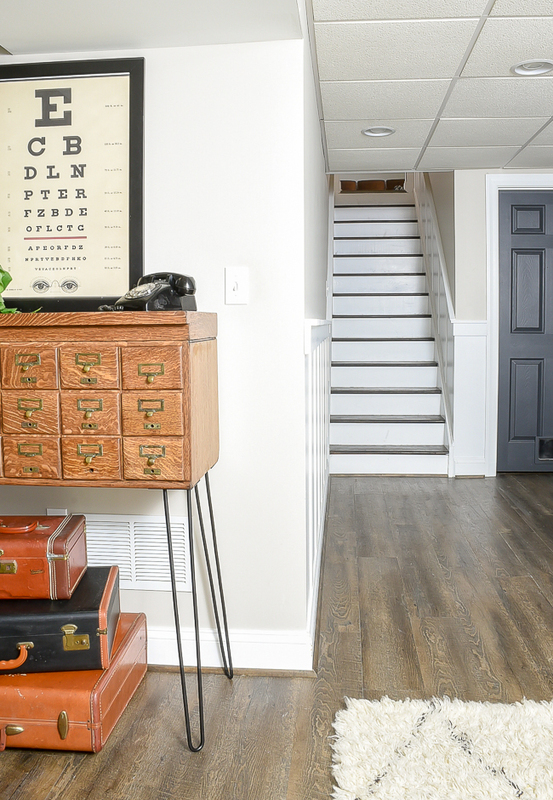 I still need to do something with the wall by the steps, but after bringing in the card catalog I'm thinking less is more. Maybe just a rug and an oversized piece of art? 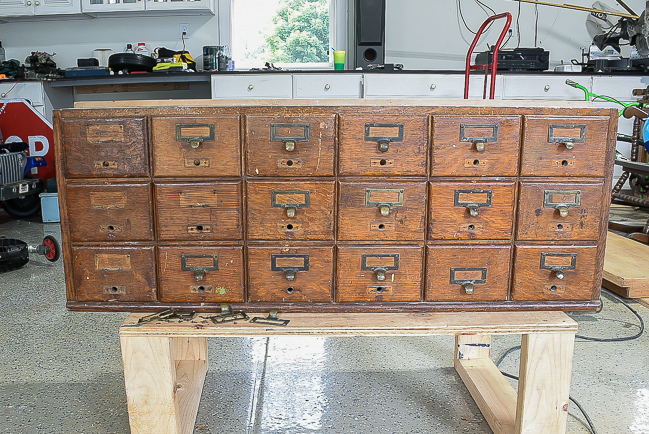 Restoring the vintage card catalog is definitely on the list of my top favorite projects. 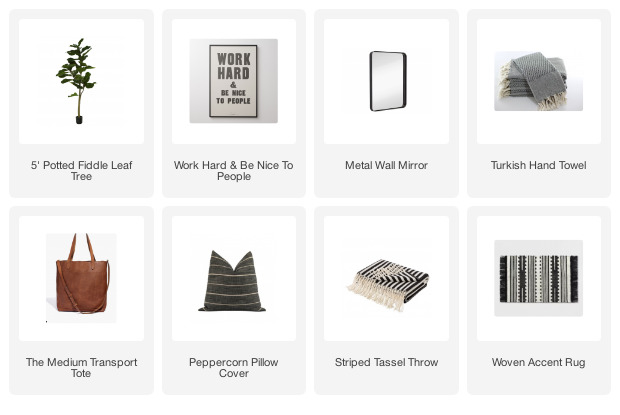 I love mixing metals and materials and the combination of wood and metal is perfect. It's a piece I have always wanted and is something I don't plan on getting rid of anytime soon. LOVE it !! It looks AMAZING !! That is gorgeous—the legs are perfect. The height is perfect. The stain: PERFECT!! 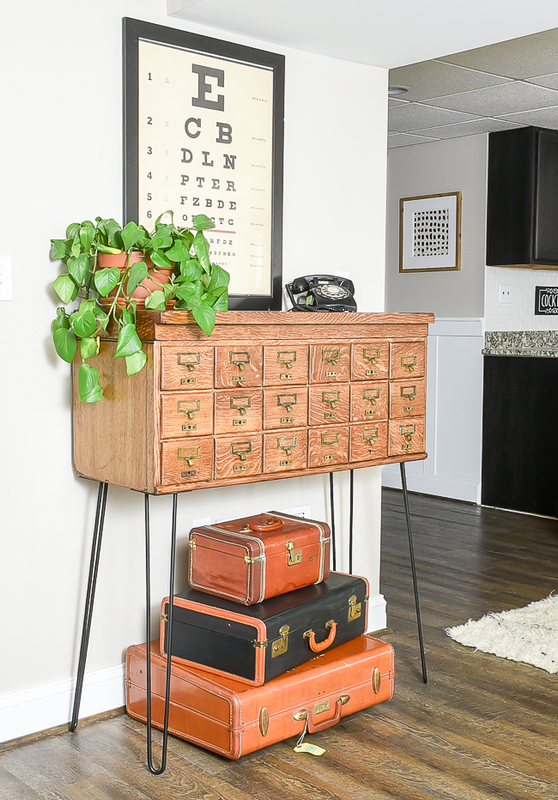 I love how you refinished the card catalog! Definitely a piece to keep as it is made of wood! I am curious though, why one drawer handle is positioned lower than the others. I see that it was that way in the before as well. Any ideas? As always....I LOVE THIS! Wow, you are talented!